It's been a while. I've been camping in an editing room for the past days, cutting a video for my bachelor project. It's all coming together now after all and about to be finished. In the meantime, the exhibition SEEING has launched at Science Gallery in Dublin together with Stephans and my piece Unseen Portraits 2. We're very proud of our first real exhibition ever, still praying that nothing will break. Visitors took more than 3.500 unseen portraits in the first week and you can see all of them online here. On June 28th, Apple was granted a patent. This one is particularly interesting for me, because it in some way transforms my Camera Restricta from speculation into prediction. The patent introduces a system that uses the iPhone's camera detecting an infrared signal in order to prevent photo capturing in certain locations. 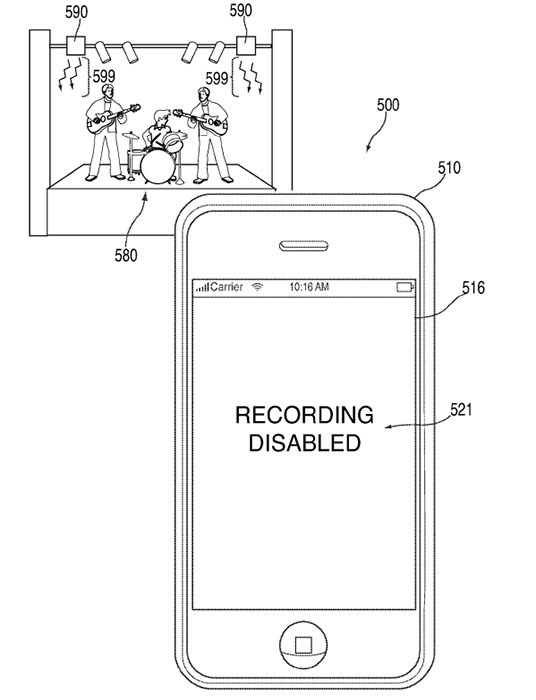 There's a band playing on the patent illustration (see below). Wow! It's intriguing and terrifying. With Camera Restricta, I had imagined a GPS-dependent restriction system, which obviously is easy to disable. Either you turn off GPS, or – if that is not an option – you wrap your camera in tinfoil to get the shot. Now the Apple system transmits information invisibly via the very sensor that you're trying to take the photo with. There is no opt-out. Let's see if this is going to become a reality.